This year’s focus is on Young Makers, with projects and activities designed around innovation, education and inspiration. We are excited to be engaging Makers of all ages. Get your entry/submission into us and we’ll provide you with a space to demonstrate, share and inspire Maker Faire attendees. As you know, Maker Faire’s success is a direct result of the cool stuff YOU make and share at Maker Faire. Come be part of this DIY community! From Dale Dougherty’s Blog about Young Makers: People learn in many different ways, but many learn best by building things. Building toys such as Lego blocks offer powerful and open-ended experiences for younger children. Unfortunately, as shop classes have closed over the past few decades, there remains very little infrastructure to nurture older kids and teens who want to expand beyond construction kits. The Young Makers program is intended to create such an infrastructure. The idea is to create a community, both on-line and physical, that brings together like-minded kids, adult mentors, and fabrication facilities. Entry Open Date: January 21, 2010. Please enter early so we can hold space for your exhibit. Notification of Acceptance: Entries submitted by March 8, 2010 will be notified by March 31, 2010. Hours: Saturday 10am – 8pm (6pm – 8pm evening program); Sunday 10am – 6pm. NOTE: This is NOT Memorial Day Weekend. Mentors help young makers define a project vision if they don’t already have one, and then guide the kids in realizing that vision. Along the way, both kids and their mentors will expose the underlying math, science, and engineering principles behind the projects, explore tool usage and safety, and collectively create a collaborative culture of innovation and experimentation. 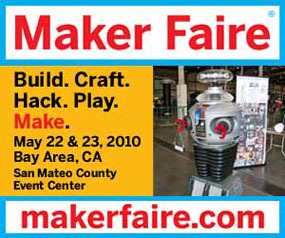 Maker Faire becomes the deadline, and offers a stage for the resulting projects to be exhibited and explained. 2. Review the application process by downloading the list of questions.